I had been wanting to have a girl’s night at my place for quite sometime. It’s always difficult to find a time and date that works with everyone’s busy schedule, and I live with my boyfriend, so it’s hard just to kick him out. But I think it’s important to spend time with just your girlfriends every now and then. I also really enjoy throwing parties and hosting people at my house – I love decorating, cooking and entertaining. 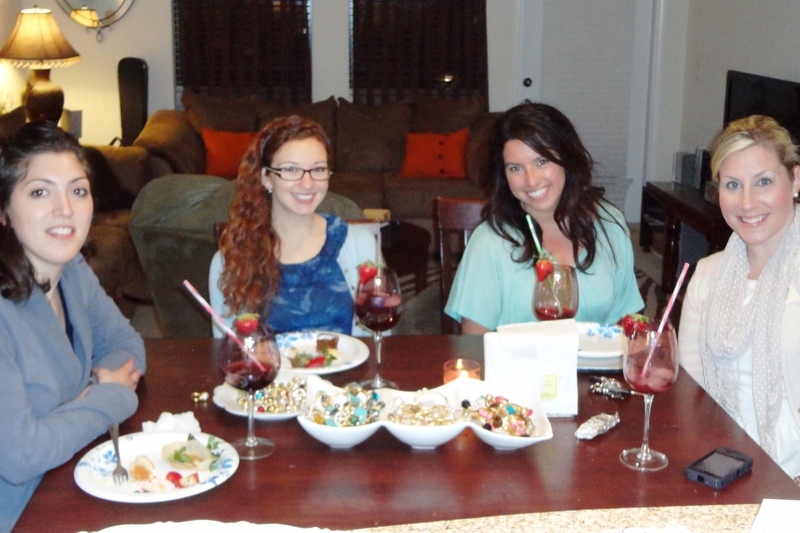 So last Thursday, after having to switch the date twice, I decided to throw the ultimate girl’s night in, a Pinterest Party! What is a Pinterest Party, you ask? Well – I thought I’d created a great idea that could catch on … until I decided to do a Google search and realized I was not the first to do this. (Shucks!) 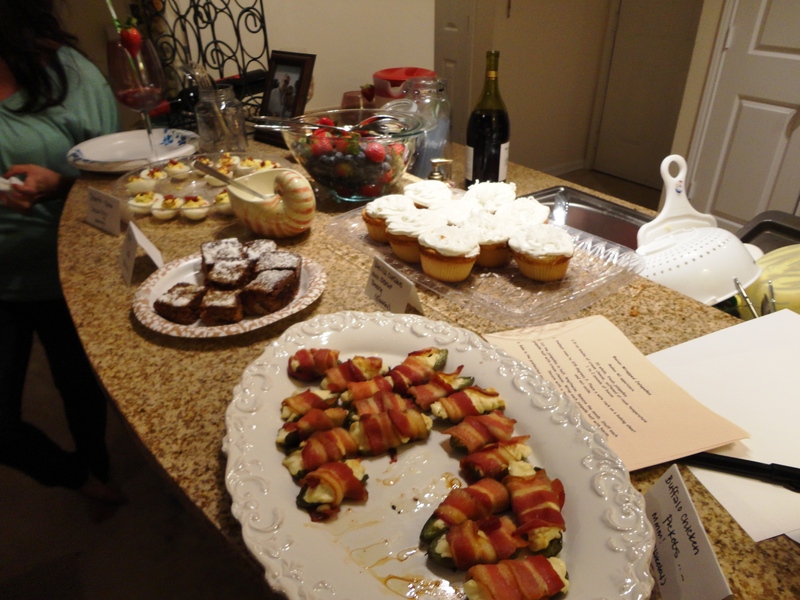 Apparently there are many different types of Pinterest Parties … I decided to go with a food theme. I created a Facebook event, invited several girlfriends and asked everyone to bring one dish from a recipe they found on Pinterest. I left it pretty wide open without many rules, requests or restrictions, so everyone could have the freedom and make whatever sort of dish they like the most. Of course, you could have each girl bring the materials for a specific craft, each bring a different craft they have previously created from Pinterest with how-to instructions or create a combination of more than one. PinterestParty.net, Rock UR Party and Green Dog Wine are a few sites with more on Pinterest Parties. 7 p.m. rolled around and it was finally party time! Eight girls showed up, each with a different food item (I was worried we might have duplicates). 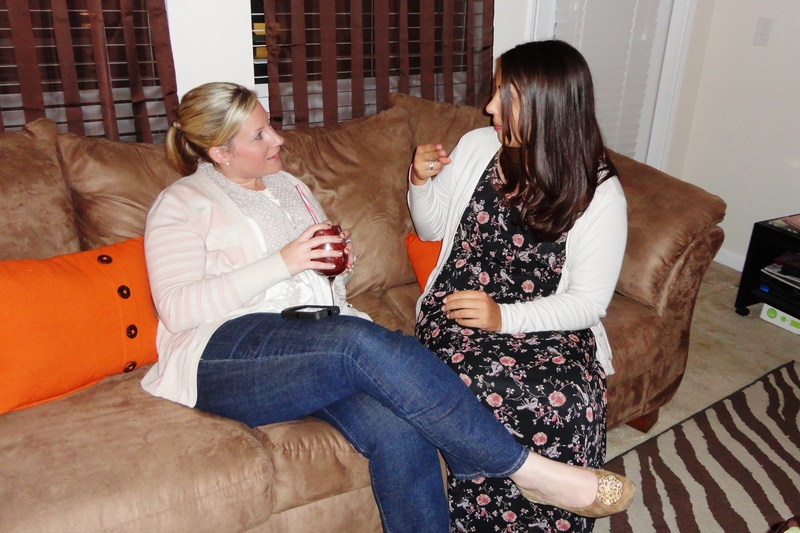 We sat around the dining room table enjoyed each other’s dishes, sangria, mimosas and each other’s company (why we hovered around a table with only 4 chairs instead of sitting in the living room with ample seating is beyond me). 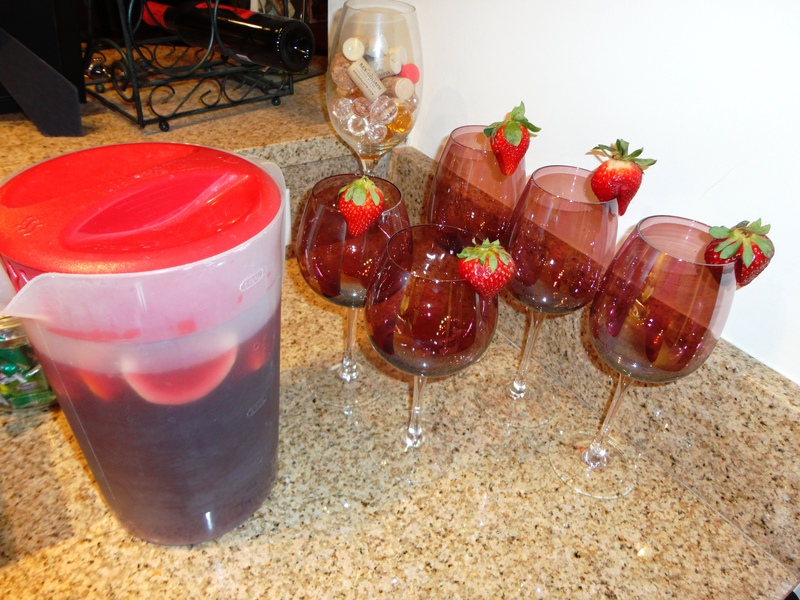 To drink, I made sangria (for the first time) and I must say – it was DELICIOUS! 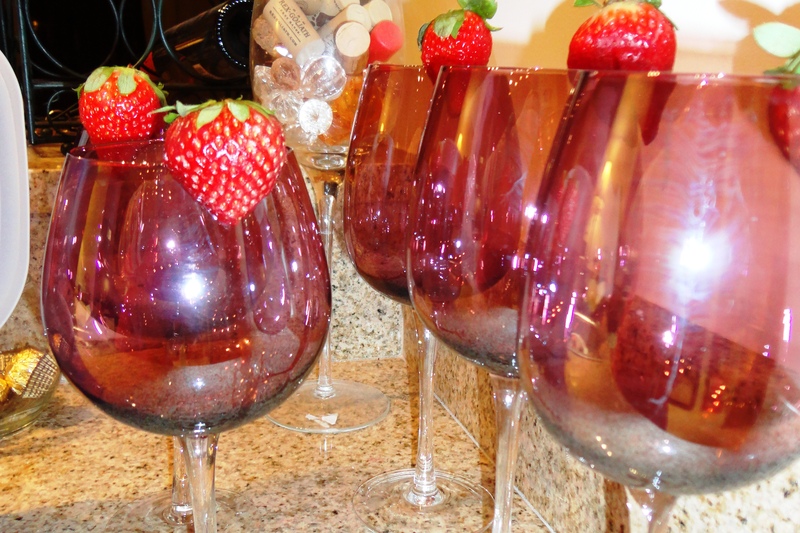 Though I have no other homemade recipe to compare it to, I highly recommend this one if you intend on making sangria in the near future. Instead of cabernet, though, I used a box of Franzia Chillable Red Wine so it wouldn’t be as dry (and because nothing beats boxed wine). I also made vanilla cupcakes with what tasted like a marshmallow cream frosting, jalapeño-bacon deviled eggs and buffalo chicken pockets. 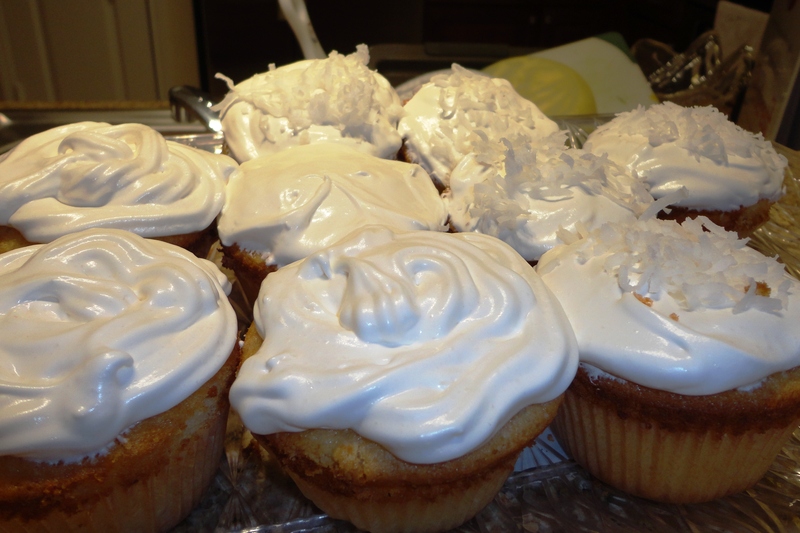 The buffalo chicken pockets and cake recipe I got from Pinterest, the frosting recipe from a friend and the eggs …. I had similar deviled eggs at a restaurant a few weeks ago and decided to try making them at home. SUCCESS! They were awesome! 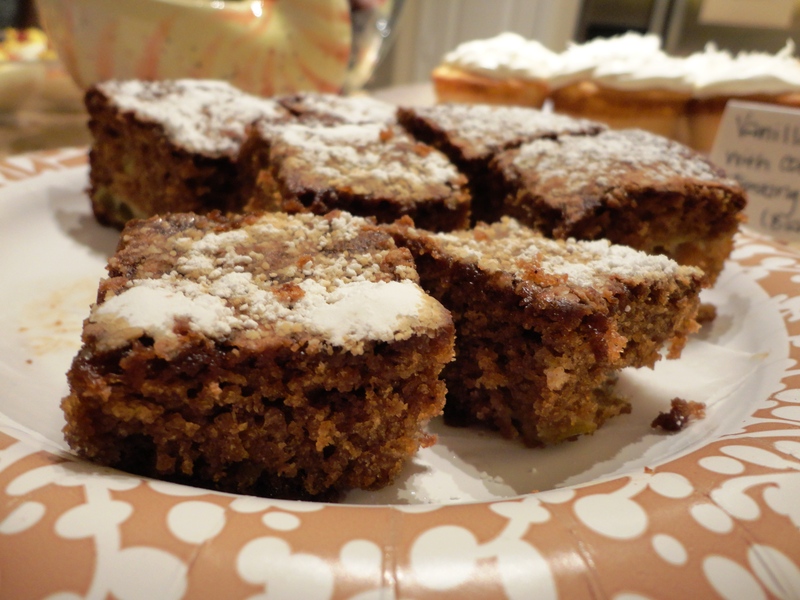 My friend Marissa is an incredible baker (she makes everything from scratch – always) and brought Apple Cake. Oh. My. Gosh. It was SO moist and mouth-watering. It is her personal recipe (not one she found on Pinterest), but – no worries – I have now pinned it! 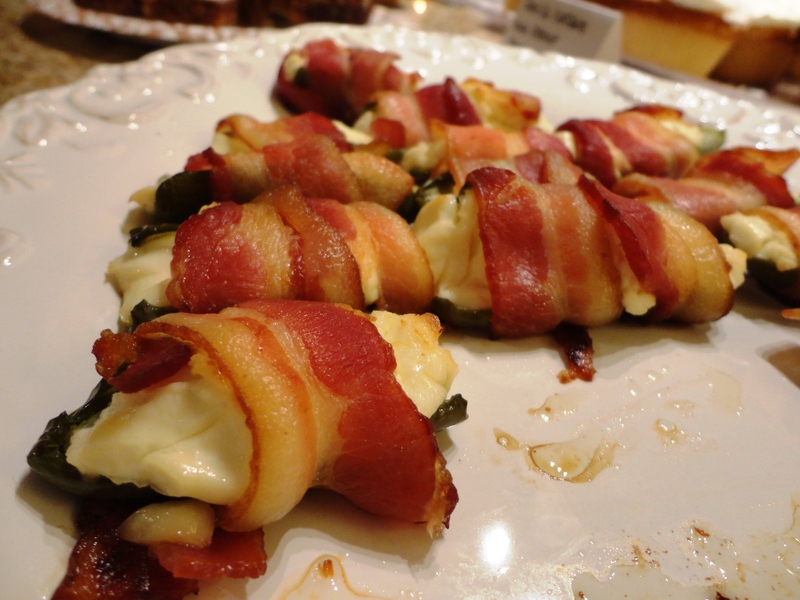 Stephanie brought bacon-wrapped jalapeño poppers. 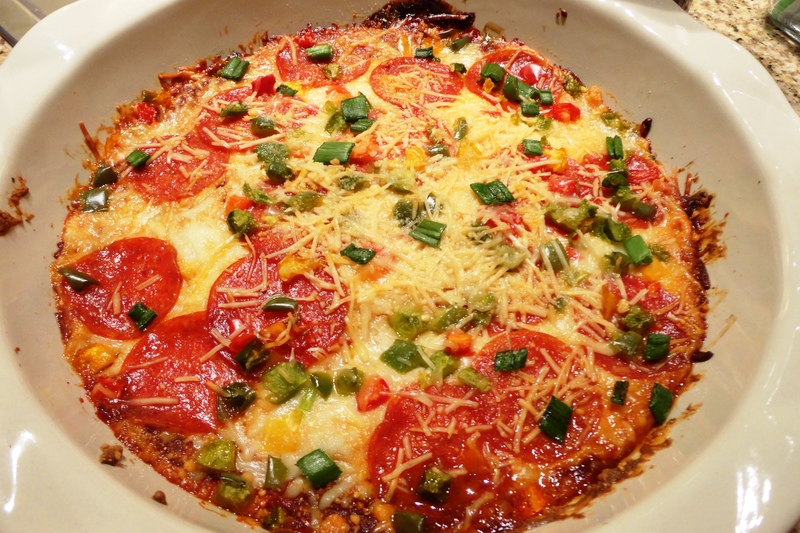 Super yummy and super easy: jalapeño, cream cheese and bacon. Stephanie (who made the jalapeño poppers) is a teacher, but in her spare time she makes and sells gorgeous wire-wrapped jewelry. She ordered a wire-wrapped ring on Etsy a few months ago and, when it came in the mail, she decided she could make the same thing. 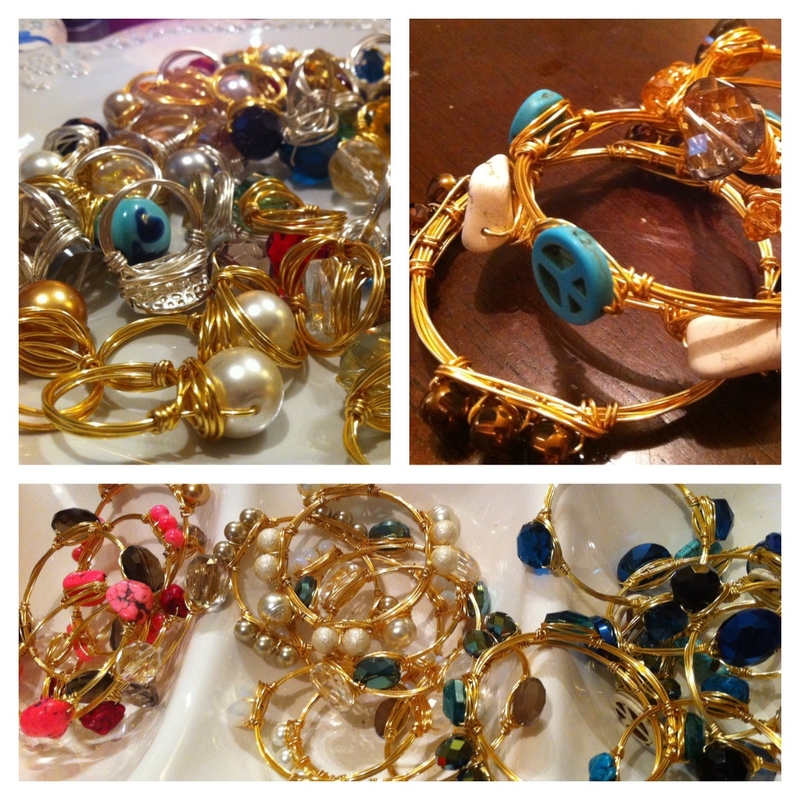 Since, she has mastered rings, earrings, necklaces, hair accessories and now bracelets. I asked her to bring some of her jewelry to the party, thinking some of the girls might like to purchase some (which they did.) Little did I know we would turn the second half of the party in to a training session, teaching Stephanie how to tweet about her business, get more involved in Facebook and use Pinterest as a business tool. Trust me – after a pitcher of sangria and a bottle of wine between the remaining 4 of us, this was pretty interesting and entertaining! The best part of the night was when she asked, “What is Twitter’s web address?” Yes, I am serious. Check out Ellie’s Sparkles on Etsy, Pinterest and Facebook and order some unique and beautiful jewelry! You can thank me later when you start getting dozens of compliments. We ended up sitting at my dining room table until 12:30 a.m. laughing, sharing stories and eating what was left of the delicious food. We had a great time and I am so thankful to have so many great girlfriends to enjoy parties like this with. 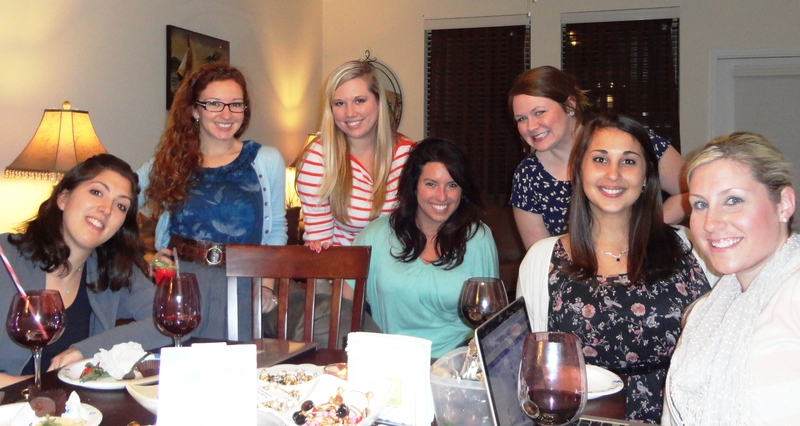 It’s amazing what you can do with social media … tweetups, creating events via Facebook and now Pinterest Parties! I already can’t wait for my next one. Maybe we will make fun wreaths! You can find all of the recipes from above and many more in my Food & Recipes Board on Pinterest. 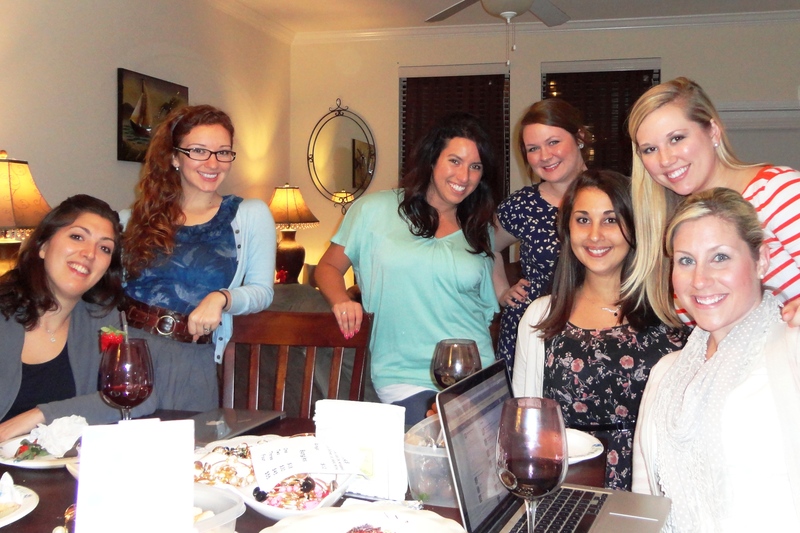 Follow my girlfriends on Pinterest: Stephanie – Amanda – Marissa – Sidney – Caryn – Tracie – Me. And to my girls that attended … Triple Baby Brown. That’s all I have to say. A plateful of beautiful rings by Ellie’s Sparkles. I love the champagne jewel on gold the best! Stephanie trying to explain Pinterest to Tracie. 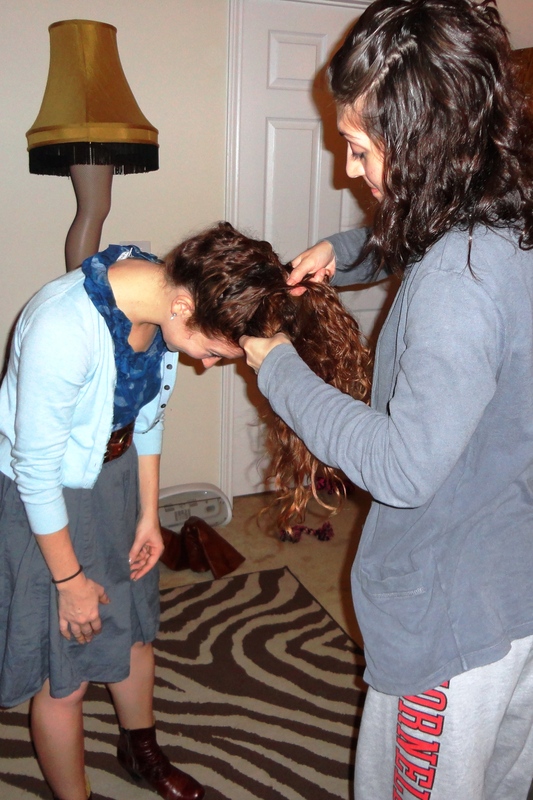 Marissa and Sidney decided to try a new hairstyle they found on Pinterest. Sure sounds like a great party. All the social networks are great for you. You were born at just the right time.